Yesterday Nancy Sanford and I pedaled from Gravesend into the lower reaches of the Thames, signaling the start of the final furlong to Greenwich. The sun broke through after midday and it turned into a glorious autumn afternoon, perfect weather to be messing around in a boat on the water in England. There was more than just a hint of symbolism slipping up the river past the bustling activity of east London docklands in much the same way as ships returning from the far east laden with spices and other oriental treasures would have done back in the golden age of sail. 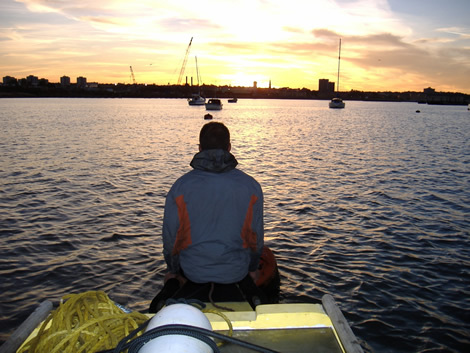 At the time of writing Moksha is moored outside the Erith Yacht Club, waiting for the next flood tide to assist the penultimate 'hop' up to the Greenwich Yacht Club. We rolled up just before dark last night completely unannounced. The club commodore and other club members didn't bat an eye, instead making us all feel instantly welcome to share their clubhouse for the evening - a converted Norwegian roll-on roll-off car ferry (the first of it's kind) moored alongside the river bank. We completely lucked out with it being bar night, and several club members offered their yachts for support team members to sleep on. What a wonderful extension of hospitality on home turf! 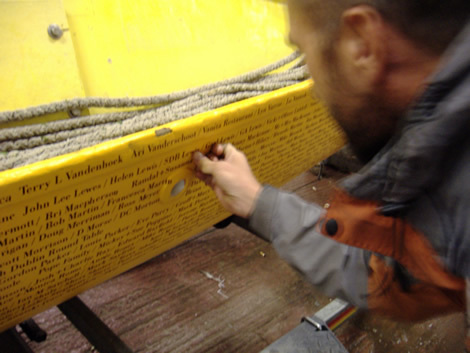 Earlier yesterday the team worked all through the night putting the 1868 names of supporters back on the side of the boat while she was in dry dock. Moksha now looks resplendent with her new figurehead that Eilbhe finished in the nick of time and the vinyl names in place. She still looks like she's been around the world, but a little spruce-up around the edges will allow her a slightly more dignified entry in the public eye tomorrow. A huge thanks also to the members of the Port of London Authority (PLA) who have been absolutely fantastic, accommodating our last minute plans and giving us the red carpet treatment for the final run into London. Date & Time: Saturday 6th October, 2007 at 11.30 am. All are invited. Look forward to seeing you there! Huge thanks to those of you who have pledged towards the shipping of Moksha to Ostend from Antwerp. The response has been so successful we now have $350 surplus which we will put towards the hire of the crane to pull Moksha out of the Thames on the morning of the 6th (475 pounds sterling).